The majority of this web site specifically focuses on Quaternary volcanoes - those less than 1.8 million years old. In contrast, this page lists volcanoes, as well has mountains incorrectly reported to be volcanoes, which do not meet the criteria for detailed description. The older volcanoes which are listed were included in previously published lists of Quaternary Alaska volcanoes, but subsequent geologic and geochronologic investigations have shown that they are too old to be included. (This page is not, however, a thorough list of known pre-Pleistocene volcanoes). This page also lists non-volcanic mountains that have been erroneously reported to be volcanoes in the scientific literature or, more commonly, public press. The false identification is sometimes based on eruption--like plumes produced by other processes, such as rock avalanches, and sometimes based on nothing more than morphology. Other false reports of volcanism consist of false eruption reports at genuine volcanoes. These are listed here: false eruption reports. This feature has been removed from the Alaska Volcano Observatory listing of Quaternary (younger than ~1.8 million years [Ma]) volcanoes as new age-dating information shows that the field is older (~3.5 million years) than has been previously reported. Wood and Kienle (1990) describe the Teller basalt field as a "small, poorly known field of cinder cones and flows on the western Seward Peninsula. A geologic sketch map shows 30 vents, most of which are small cinder cones. Flow and cone morphology is presumably similar to the better known Imuruk basalt field." And, although Wood and Kienle report ages of 2.8 to 2.5 Ma, a recent paper by Mukasa and others (2007) gives new age-dates of ~3.5 Ma, and further states: "volcanic activity in the Teller region was of very short duration, in all likelihood not exceeding 300-350 thousand years. There is no indication of any volcanism in this area that is younger than 3.3 Ma." 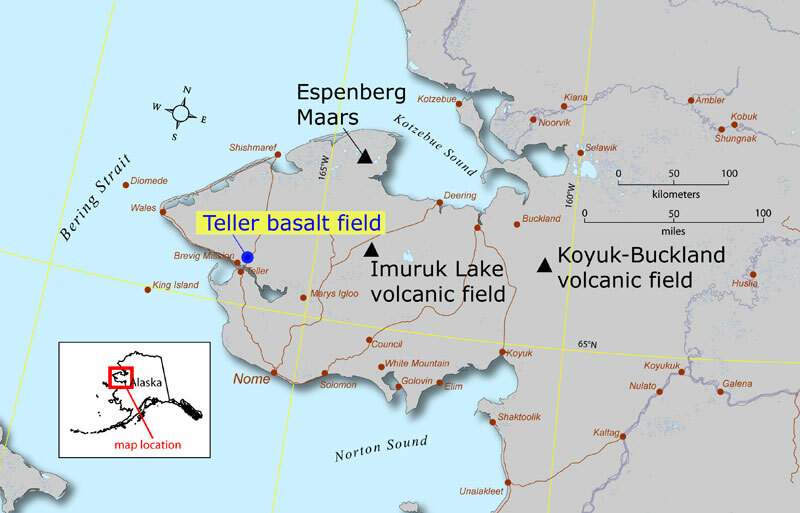 Mukasa, S.B., Andronikov, A.V., and Hall, C.M., 2007, The (super 40) Ar/ (Super 39) Ar chronology and eruption rates of Cenozoic volcanism in the eastern Bering Sea Volcanic Province, Alaska: Journal of Geophysical Research, v. 112, 18 p., doi: 10.1029/2006JB004452, 2007. Non-volcanic mountains in southeast Alaska. In 1775, Francisco Mourelle reported that while anchored in Bucareli Bay "The nights are extremely bright and mild, because of seven volcanoes of snow and fire, which with their vapors illuminate and temper it" (Olson, 2002). Olson (2002) notes that this observation is ". . . most puzzling. On a chart supposedly based on this observation, the note 'Land of Volcanoes' is inscribed north of Bucareli Bay. This writer has consulted with several Alaskan geologists and they all agree that there were no known volcanoes erupting in this area at this time in history. . . . Dee Longenbaugh, a well-known Alaskan historian, has suggested that perhaps there was a forest fire burning behind the hills or mountains to the north. Mourelle's volcano observations are not corroborated in the journals of others present on the voyage, nor are they repeated when he revisited Bucareli Bay in 1779." Because Mt. Calder is a prominent peak located north of Bucareli Bay, Grewingk (1850) and subsequent compilers attributed Mourelle's 1775 observations to Mt. Calder. Mt. Calder is composed entirely of Silurian and Ordovician sedimentary rocks, and is not volcanic (Gehrels and Berg, 1992). Gehrels, G. E., and Berg, H. C., 1992, Geologic map of southeastern Alaska: U.S. Geological Survey Miscellaneous Investigations Series Map I 1867, 24 p., 1 sheet, scale 1:600,000. Mourelle de la Rua, F.A., 1781, Journal of a voyage in 1775 to explore the coast of America, northward of California: J. Nichols, London, p. 471-534, 1 chart. Olson, W.M., 2002, Through Spanish eyes: Heritage Research, Auke Bay, AK, 576 p.
Early explorers to Alaska often located the highest peaks in a region and called them "volcanoes." Early exploration reports of "black stripes on the snow" of Mt. St. Elias (Collie and others, 1839) were probably due to snowmelt and vegetation rather than volcanic ash. We now know that these peaks are not recently volcanic; Mt. St. Elias is composed of schistose metamorphic rock; Mt. Crillon is composed of Tertiary gabbro and Cretaceous volcanics; Mt. Fairweather is composed of sedimentary and intrusive rocks (Winkler, 2000 ; Gehrels and Berg, 1992; Plafker and MacKevett, 1969). However, even in 1850, the assertions that Mt. St. Elias and Mt. Fairweather were volcanoes were challenged; Grewingk (1850) writes that he examined all available travelogues and couldn't find any mention of volcanic activity at either of these peaks. Collie, Alexander, Belcher, Edward, and Sir William Buckland, 1839, Notices on the geological structure of the numerous and distant points of the globe visited by Captain Beechey on his late voyage, selected by Professor Buckland from the notes: H.G. Bohn, London, p. 158-180. Plafker, George, and MacKevett, E.M. Jr., 1969, Mafic and ultramafic rocks from a layered pluton at Mount Fairweather, Alaska: U.S. Geological Survey Open-File Report 371, 15 p.
On July 9, 1953, Mt. Spurr near Anchorage, Alaska, erupted, showering Anchorage residents with ash. Initial newspaper accounts of the event declared "CITY BLACKED OUT BY 3 VOLCANOES!" 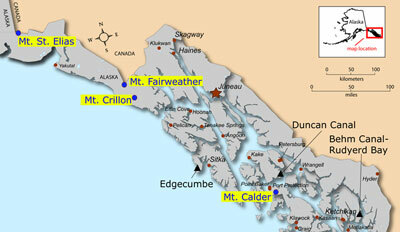 and claimed that Mount Spurr, Mount Torbert, and a third, unnamed peak were all erupting. 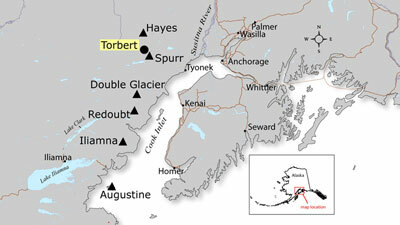 Mount Torbert is about 9 miles northwest of the summit of Mount Spurr, and about 11 miles northwest of Crater Peak (the vent on Mount Spurr that erupted in 1953). Mount Torbert and the unnamed peak are not volcanoes, and were not erupting. Subsequent newspaper articles of the time continue to list Mount Torbert as erupting, and a New York Times article also wrongly claims that three volcanoes were erupting, possibly four. The first scientific publications of the event attempt to set the record straight. Wilcox (1953) writes: "The eruption took place from an old ice-filled vent at an elevation of about 7,000 feet on the south shoulder of Mount Spurr [Crater Peak], about 80 miles west of Anchorage, Alaska. Reports of concurrent eruptions from other points on Mount Spurr and Mount Torbert, must be regarded with suspicion, for nothing in the subsequent pattern of ash deposits on the snow in the area supports these reports, and no new snow had fallen before the observations were made (Juhle and Coulter on July 11 and Wilcox on July 12) that might have obscured the ash from other vents." Subsequent study by AVO geologists has determined that there are no historically active volcanoes within 50 miles of Mount Spurr, and that Mount Torbert is not a volcano. Unfortunately, references to Mt. Torbert erupting proliferate to this day - as in the erroneous "Alaska Remembers" article in the November 2003 article of Alaska Magazine. Associated Press, 1953, Anchorage is darkened by ash of 3 volcanoes: The New York Times, July 10, 1953, section L, p. 21. Unknown, 1953, City blacked out by three volcanoes! : Anchorage Daily News, v. 6, n. 57, front page, July 9, 1953. Wilcox, R. E., 1953, Preliminary report of the eruption of Mount Spurr Volcano, Alaska, July 9, 1953, and the ashfall in the Anchorage area: Denver, CO, U.S. Geological Survey, 22 p.